For the Litwaks living in what’s probably the second oldest building on the Main Line has brought some changes to their lives. Their house, called Penn Cottage, was built in 1695, then added on to over the centuries. The latest addition is an attached kitchen which is a mere 100 years old, having been built sometime around the turn of the century. In 1995 when Gerald and Ellen moved in with their two children, the Wynnewood house was livable, but needed work. But with a heritage going back 300 years, they were concerned to insure they maintained the spirit of the Welsh farmhouse. The family warmly welcomed the society’s interest and have joined it themselves. 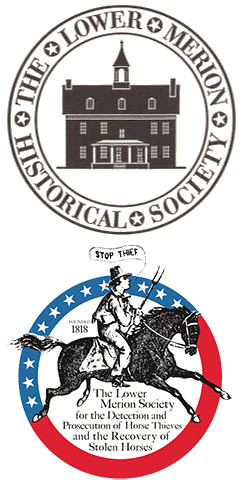 “We go to the meetings are really enjoy it.” In addition, the Welcome Society of Pennsylvania has put a plaque on the house, noting its history. The organization is so-named for the ship that carried William Penn from Wales to America on October 27, 1682. Penn Cottage was built by Robert Owen, who arrived in 1690. Originally the property included 440 acres and cost Owen 100 pounds when he bought the land in 1691. The name Penn Cottage came from journals of the time that indicate he stayed there when he came at some point to address the Welsh Quakers. The original building was constructed in 1695 by Owen on land he purchased in 1691 from Penn’s Deputy Governor, Thomas Lloyd. Owen was the magistrate and justice of the peace for Merion as well as a state assemblyman. Because of that the house was used as a court as well as Owen’s residence. But the site has been inhabited long before the Welsh. It was a Lenni Lenape Indian village for centuries. A community leader, he was an active Quaker and was naturally active in the Friend’s Meeting up the road. Although the Welsh Quakers settled in 1682, by 1695 they were ready to build a meetinghouse to be their place of worship: the Friends Meeting in Merion which is still in use. Owen was ready to build his own stone house two miles west on what would become Old Lancaster Road and then Montgomery Avenue. Ostensibly he hired the same stone masons who built the Friends Meeting. But the meetinghouse built in 1695 was not stone construction on the stone building began 18 years later. But there is enough similarity in the stone masonry to indicate that it very well may be the case. In any case there wouldn’t have been too many teams of talented stonemasons in as remote an area as the Welsh Tract. It may have been that the Quakers used the same stonemasons as Owen had. Robert Owen died in 1697 and the house went to Robert Owen’s son, Evan Owen, one of Robert’s eight children, the deed having been confirmed by Penn’s commissioners in 1707. Although Penn Cottage has a date stone in the original section of the house dated 1695 there is another historical issue common in recovering the time line of historic structures. Buildings tend to be dated from the beginning of their construction, not the end, and also from the oldest remaining piece. For three years in England I worshiped in a 12th Century Anglican church. That was proven by the complete list of rectors from 1182. However there were only about a dozen stones left in the base of the tower that were part of that original construction, but that was enough to generate 12th Century bragging rights. So too with any early structure. For the most part folks were too busy building and trying to stay alive to maintain records satisfactory two hundred years later. But no matter when it was started, a stone building wasn’t built in just a couple of months. Nor was it often built all at once. As families today live over under and around and through a restoration, probably the original owners did the same thing. Penn Cottage is typical of Welsh architecture of the time, originally it was probably a “‘Welsh half-house,” subsequently enlarged. It was typical of one thing when it was built: they retain the look of Welsh farmhouses of their owners’ abandoned homeland. Although the stone is different, it’s close enough to the ubiquitous grey stone of Wales. The walls are 18 inches thick, and the newer sections matched the original stone extremely well. Laymen would have to look very closely to see the line of the older house. The new walls date from 1873. That was when the original house was altered to what we consider today a more “colonial” design, which a center stairwell and large rooms to either side in the front and smaller rooms in the back. Today the ‘front’ of the house faces away from Montgomery Ave. and there is a driveway circling the house. In 1903, a new wing was added to the side of the house which increased the size and allowed for a modern attached kitchen, but luckily even then they had the sensibility to maintain the integrity of the original house. All of the old stone walls remain. Although the newer construction is now covered in cedar shingles. With that addition the house is fairly large by today’s standards, although not what would be considered a ‘grand’ house by Main Line standards. It today has five bedrooms, although the Litwaks use several for other purposes. The second floor of the twentieth century addition is now a master bedroom with it’s own circular staircase down to the kitchen. The first floor kitchen is large and the Litwaks have maintained the original cabinetry. It was clearly a family kitchen with an attached laundry room, lavatory and pantry. In the pantry are the original built-in storage cabinets. A passageway leads from it to the original house, past a bow-shaped room the Litwaks call the ’roundhouse.’ “This was originally a preparation room for tea, it’s now a small library,” says Gerald. You then enter a long dining room, and pass through to the living room, a den, The house has four working fireplaces in the dining room, living room, den and master bedroom on the second floor. But for the Litwaks, who renovated the house after they moved in five years ago, its easier to live in than their previous “modern” house, a 45-year-old ranch in Bryn Mawr. “We had an 800 ft. driveway up to the house, which was set in the woods. After all the ice storms in the early 1990s my wife decided it was her or the driveway,” he says. “So we started looking we had looked at this one, then it went off the market, they came back on. They then restored much of the interior, which was, according to Gerald, ready for work. The plank floors were stripped of layers of finish, including black paint. Walls were restored to their original plaster, and one of the frustrations the Litwaks endured was discovering that colonial era plaster wouldn’t hold wallpaper. Only the later walls were capable of this. But their restoration was true to the era, and the interior of the house looks colonial, and elegant. Although the furnishings don’t dissuade from the house’s colonial heritage, it doesn’t have the ancient and uncomfortable feel of a pioneer farmhouse, built within the first decade of Welsh settlement. Ceilings are fairly high — evidently having been raised several times. Except for rather low doorways, there is little feel to this house’s three centuries. The downstairs rooms are spacious, perhaps in keeping with this building’s use as a magistrate’s court and public house during its life. The four upstairs rooms are more typical, although only in the third floor servants quarters do the walls and ceiling begin to close in on you. The Litwaks have solved that problem by turning that space over to their teenaged daughter. One look at the two-room and a bath space makes it clear this is happy teenager territory. Unusual for this house is its four bathrooms. Granted they weren’t there in earlier times, for a modern house it makes a great deal of difference to its livability. “For us this is actually an easier house to live in then the previous one. With stone walls and wooden floors there’s little to go wrong,” he says. One thing that could work better are the remote switches that the ancient construction called for. “You don’t want to tear out this plaster just to put electrical wiring in,”he says. Although skeptical of the electricians romantic explanation, I must report that while photographing the switches, my electronically controlled camera jammed several times. That was shortly prior to this intrepid reporter’s conclusion of the interview and departure from the premises.